Croatian cruiserweight Marino "Cro Beast" Goles (16-1) has 24 rounds of championship boxing ahead of him in September. 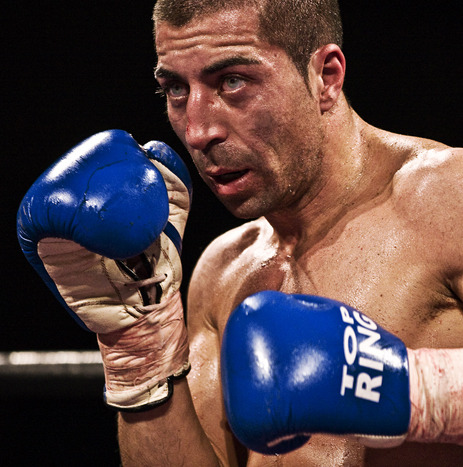 On September 5 Goles defend the World Boxing Foundation title against Bekim Pagga (4-5) in Loznica (Serbia). Then on September 20 in Holzminden (Germany) Marino moves up to heavyweight to challenge WBU (the German organization) champ Mark De Mori (26-1-1). The WBU is aware of the situation and President Torsten Knille says there is a good opponent available for De Mori should Goles be unable to fight. Brit Lee Selby (19-1) was all set to defend the EBU featherweight title October 4 against Davide Dieli (15-3) but have now relinquished the title to for a final IBF eliminator. Since Matchroom have the date and an opponent for Dieli the EBU council have by majority vote allowed Josh Warrington (18-0 and # 6 in the EBU ratings) to take on Dieli (pictured) for the vacant title and the fight go ahead in Leeds October 4. The postponement of Wladimir Klitschko´s defence of the WBA, WBO, IBF and IBO heavyweight titles against Kubrat Pulev September 6 in Hamburg also led to a cancellation of a fight between Swedish heavyweight Adrian Granat (4-0) and British veteran Danny Williams (46-23). EC Boxing, who promotes Granat, is looking for another date in September for the fight or it might go ahead October 31 in Cuxhaven where EC stage their next show (televised by EuroSport). Granat is still to take on Serdar Uysal in Copenhagen September 13 on Sauerland Promotion´s next edition of Nordic Fight Night. Middleweights Istvan Szili (17-0-2) and Matteo Signani (20-4-3) clash for the vacant EU title September 28 in Gatteo Mare (Italy). Boxe Loreni promotes the fight. Hernandez retained the IBF cruiserweight title on scores of 115-113 and 116-113 while one judge had it 115-113 for Arslan after a close, hardfought fight with few highlights as Arslan attacked and stayed close while Hernandez tried to keep the challenger at bay, tired but still scored with effective punches. Culcay won the EBU title and retained the WBA I/C crown on scores of 115-112, 115-113 and 117-110. Culcay was down in the third. 38-37x3 after four, 78-73 twice and 77-75 after eight..
Zeuge won the vacant IBF Int´l title after a onesided beating of mr fake record Barakat, who was down in the first and have little to do even at this level. 80-71 after eight. According to boxingscene´s report Abdoul was down in the third but I don´t believe it. Prodebut for former Olympian and amateur star Härtel. 60-53 on all cards, Fedotovs had a point deducted in round three after a headbutt. The neat boxing Ceylan started well but faded in the later rounds as the smaller but stronger Spaniard attacked. 77-75 Ceylan, 77-77 and 77-75 Montilla. Wahlström retained the EBU female superfeather title on scores of 100-90 on all cards. Mitev was down from a bodyshot in the third. Chudecki was down in the fourth while Lora was floored in the seventh and tenth. It was scored 99-89, 98-89 and 98-92. Jackiewicz´s farewell to boxing for a career in MMA. 80-72, 79-73 and 78-74. 10-9, Ogle floored twice in the second. Stutans floored and stopped as he got up. 10-10, Zamelis floored twice in the second. 20-17, Kudasev down in the second. Sadihovs docked a point in the fourth for punching behind the head. Eksevics down in the third.